Always Crafting: Do you use background stamps? I have been looking for really good background digital stamps for a while now and I came across this site, Hambo Stamps, that sells really detailed incredible background digital stamps. You can find the link here. I purchased the stage background to use for my Superstar Anya card below. I just love the background don't you? The idea to have a setting for my stamps has been rolling around in my brain for a while now. Using a background can give your cards some depth and interest. Wanting a moonscape background I emailed Monica, the site owner, and asked her if she would consider making one. Well she got right back to me and told me that they would! Love it! My next request will be for a beachscape! The possibilities are endless! Way to go Hambo Stamps! 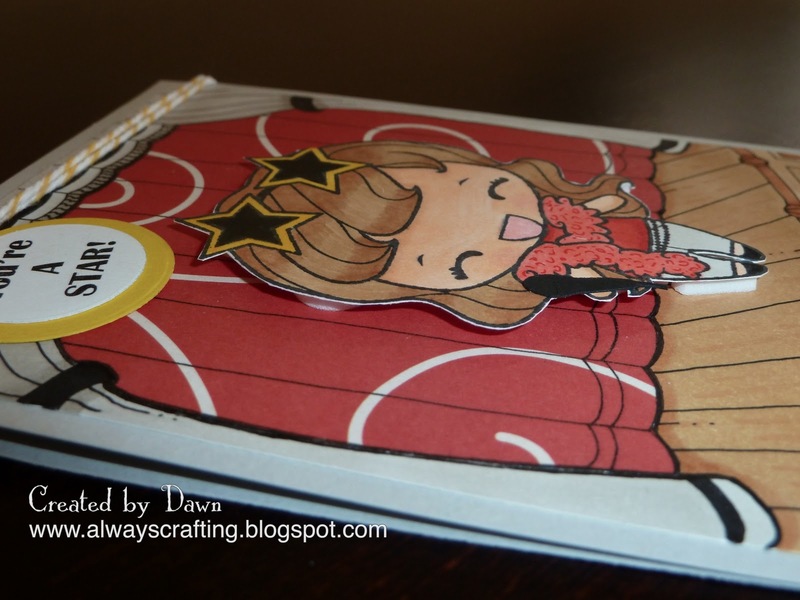 For this card I printed the background stamp on white cardstock and printed paper. I cut out the large background curtain from the printed paper and placed it over the white cardstock after I colored in the rest of the background. Then colored up the Superstar Anya stamp and cut her out. Next, she was placed her on the stage with pop ups. She just had to be singing on her stage so I added a microphone cut out with my cricut. Added some twine and sentiments, then she was ready for her preview! Monica, posted this card on the Hambo Stamps blog. Here is the link. Thanks Monica! Love this. Thanks for the link! That's awesome Dawn! I haven't tried the digi stamps yet, but you are making it tempting. WWoooo weeee for that stage! Excellent way to portray Anya......center stage!! Well done with your layout! Woooo weeee ! I'm totally singing now. Thanks for allowing us fairies at FFF to inspire your song creation this fortnight! good luck! Yes, I do use background stamps. Love them! You've done an excellent job on this card. 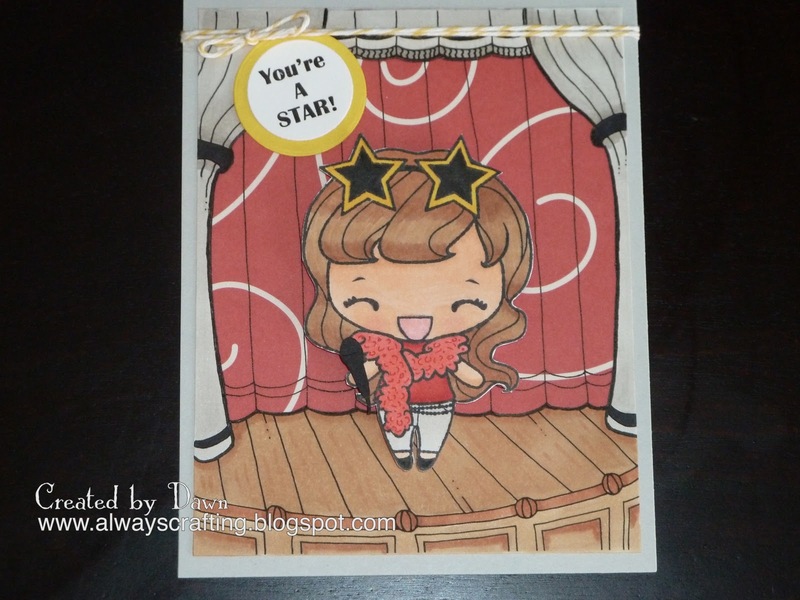 So glad you joined the Stampin' B's 'music' challenge this week. How awesome! This is just amazing...Your coloring is fantastic and I love the twine embellishment! gorgeous card with Anya as a star singing on the stage....thanks for playing with FFF...hope to see you next time again! Anya looks fab with that stage behind her! Lora, thanks! I added the link Digital Tuesday's challenge.